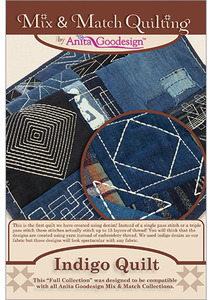 This is the first quilt we have created using denim! Instead of a single pass stitch or a triple pass stitch these stitches actually stitch up to 15 layers of thread! You will think that the designs are created using yarn instead of embroidery thread. 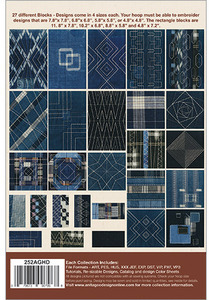 We used indigo denim as our fabric but these designs will look spectacular with any fabric. Your hoop must be able to embroider designs that are 7.8”x 7.8”, 6.8”x 6.8”, 5.8”x 5.8”, or 4.8”x 4.8”. The rectangle blocks are 11. 8” x 7.8”, 10.2” x 6.8”, 8.8” x 5.8” and 4.8” x 7.2”.